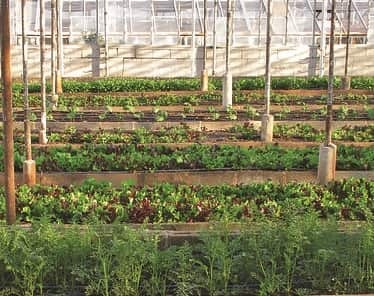 Agricultural innovators around the world are developing new processes for growing more food in less space, using less water and resources. They will need to feed a growing population in conditions that are likely to get more difficult with time. Several start-ups in India are also working on ways to re-use agricultural wastes and reduce the air pollution and lung disease currently caused by burning farm fields after harvest. "In developed countries technology is creating a comfort or a convenience, whereas in Ethiopia it’s creating a necessity,” according to a young tech innovator there. That's true in many developing countries, and it means their new innovations may be life-changing. I found two fascinating articles on boosting agricultural productivity, making the best use of limited resources. The first is the story of an American who started a garden to help feed his own family-- and ended up creating a nonprofit organization to share the techniques he learned with volunteer groups around the world. Beginning with an empty backyard pool, he developed a complete sustainable ecosystem with a vegetable garden, chickens, and a fish pond. He has since designed systems for water-sterilization, rain-collection and reuse, and vertical gardening for different projects in the Caribbean, including a prison garden and the restoration of a school farm destroyed by Hurricane Irma. They have rebuilt the farm to make it better able to survive future storms. It’s an inspiring story, well worth reading. The university works with graduate students from all over the world, experimenting with various ways to improve food production to meet the needs of a population nearing 10 billion by 2050. “The challenge? …the planet must produce ‘more food in the next four decades than all farmers in history have harvested over the past 8,000 years.’” The good news is that they believe they’ll be able to do that. The article explains how. India has a major air pollution problem caused by burning agricultural wastes, but there have been no good alternatives for farmers in the past. Now a number of new biotech companies are finding better ways to re-use that waste, “from using paddy straws to generate bio-coal briquettes or fodder to developing eco-friendly cremation materials…” You can read more about these start-ups here. The final article, from the BBC tells about the development of a new tech hub in Addis Ababa, Ethiopia. Some of the start-ups, like a hydroponics company, are developing products for local farmers. Others are for non-farm needs, but all are concerned with offering solutions to major unmet needs. Ethiopia has not been hospitable to local companies in the past, but the situation is changing and many are hopeful that Addis Ababa can become another center for innovation. You can practice the vocabulary from these articles with a new crossword. Its answers are here. Briquettes are man-made coal replacement pellets—a fuel that burn easily. Cremation is the process of burning bodies after death. Fiber is the stiff, non-soluble, part of plants. A funeral is a ceremony for the someone who has died. A hub is the center of a wheel or (now) a center of business or innovation—a place where related businesses can come together and possibly share resources or equipment. Incubators are enclosures with controlled temperatures and other conditions. They can be used for growing baby chicks or bacterial cultures or protecting premature babies. The word is now often used (as in these articles) for protected conditions to allow new tech companies to get started. A launch is the official beginning of a new product or start-up company. A paddy is a (flooded) rice field. A pond is a small pool of water, whether natural or artificial. Straw (as an uncountable noun) is dry plant stalks. Domestic animals sometimes ear straw. Stubble is the plant remains left in a field after the harvest. One last note: I just learned that an ESL teacher I really respect will be offering a course on studying current news and its vocabulary starting May 1. If you’re interested, you’ll need to sign up in the next two weeks, so I wanted to let you know about it. There’s more information at the bottom of my page on Understanding the News in English.